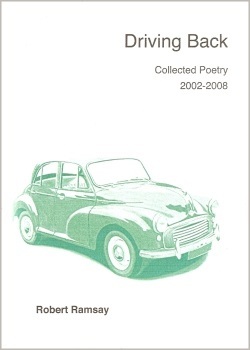 Robert Ramsay's book of poems Driving Back, collected over five years, contains poems of the land, of childhood, love and the male menopause, of his experiences as a farmer in Scotland and as an engineer and holiday maker in West Africa. It was launched alongside Olivia McMahon's novel Love as a Foreign Language at an event that also included music from Morag Skene and Tom Dailly. This was a thoroughly enjoyable and neatly structured event. 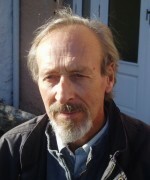 Robert Ramsay read two contrasting selections of his well-crafted poems with great authority and apt flashes of humour. The first set of love poems was especially fine. The book itself is excellent value, containing a very generous number of poems. He is well-served by his publisher. Olivia McMahon read some enticing extracts form her novel which sadly was not available on the night. But we heard enough to encourage us to look out for it this summer. It is delicate, humorous and with sensitively observed relationships, much drawn from Olivia's professional life as a teacher of English as a foreign language. Music was provided by the resonant singing of Morag Skene and the singer-songwriter Tom Dailly – an engaging performer. The ambience of Cellar 35, even without the smoke of old (thank goodness) was perfect for the darkened enthusiastic audience. Both authors deserve good sales figures. Buy! Robert Ramsay has been writing poetry since he stumbled on its therapeutic effect in the 1990s. From his childhood on the land he went to engineering, which took him to Nigeria. He returned to Angus, to farming, in 1974, surrendered to his sons in 2000. He has been scribbling since.